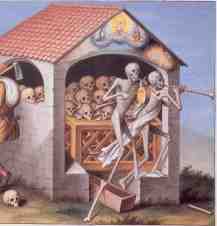 Basel's Dance of death, the ossuary. 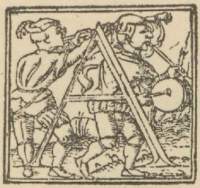 The dance is introduced with drums and trumpets. 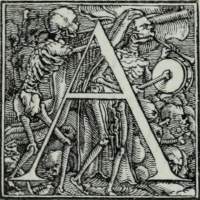 It's not hard to see where Holbein found the inspiration - since he lived in Basel at the time, and both of Basel's dances of death start in a similar way (picture to the left). 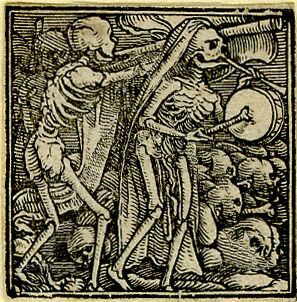 In Holbein's picture as well as in Basel's dances of death, one Death is beating the drum and blowing a fife, while the other Death plays the horn. 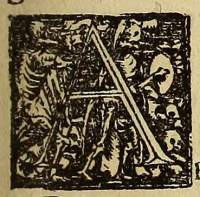 In the background lots of skulls are piled up. 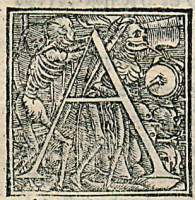 This gives us a way of proving that Holbein's dance of death alphabet is older than his great dance of death: The alphabet is much closer to its model (Basel's dance of death) than the latter is (see picture below to the right). 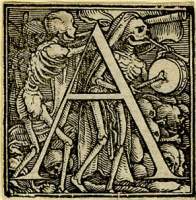 Holbein's dance of death, The Bones of All Men. 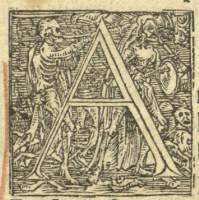 The first part is 1st Corinthians 15,22, which in Luther's translation goes: »Denn wie sie in Adam alle sterben, so werden sie in Christus alle lebendig gemacht werden«. 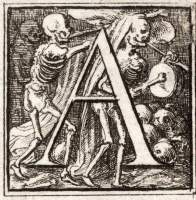 In English is goes like this: »For as in Adam all die, even so in Christ shall all be made alive«. This is where St. Paul introduces his new invention: The Original Sin. 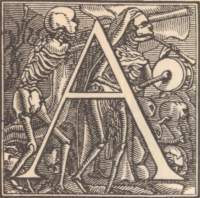 The second part is from the Revelation 8:13, which Luther translates thus: »[...] Weh, weh, weh denen, die auf Erden wohnen [...]«. 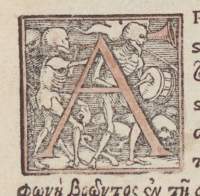 In English: »And I beheld, and heard an angel flying through the midst of heaven, saying with a loud voice, Woe, woe, woe, to the inhabiters of the earth by reason of the other voices of the trumpet of the three angels, which are yet to sound!«. 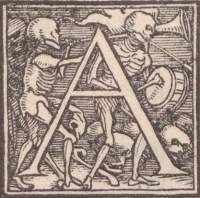 This quote was also used in the dance of death (picture to the right). 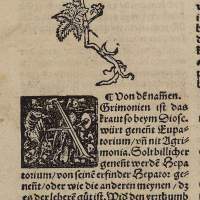 To the left is a copy designed by Hollar.